This post contains affiliate links. This means that if you decide to click on any of them and make a purchase, I might receive a small commission that helps me keep the blog running. Thanks for your support. This was the first book I bought to help me on my AIP journey, nearly 3 years ago. Mickey Trescott launched her Autoimmune Paleo Cookbook at the time, as an ebook. And, seeing that there was so little in the way of recipes for the autoimmune protocol, and desperate to calm my psoriasis, I downloaded it as quick as I could. Flicking through the pages as I tapped my laptop's mouse, AIP suddenly became a lot more realistic and do-able. The book was soon released in paper format. And now it's been adapted, tweaked and had more recipes added to it for us UK peeps. Mickey arranged for me to receive a copy to have a look at, and I can tell you now that if you decided to add to your AIP cookbooks, even of you bought the ebook version - this would be a good buy. The chunky book isn't kept on my bookshelf with my other cookbooks. It's wedged firmly between the fruit bowl and the wall on the worktop in my kitchen, so I can grab it quickly. It's really that kind of book. Always one to encourage my children to eat better, I sat my seven-year old down with the book and asked her if she'd like to choose something for me to make. She chose the mango ice pops. They were perfect. 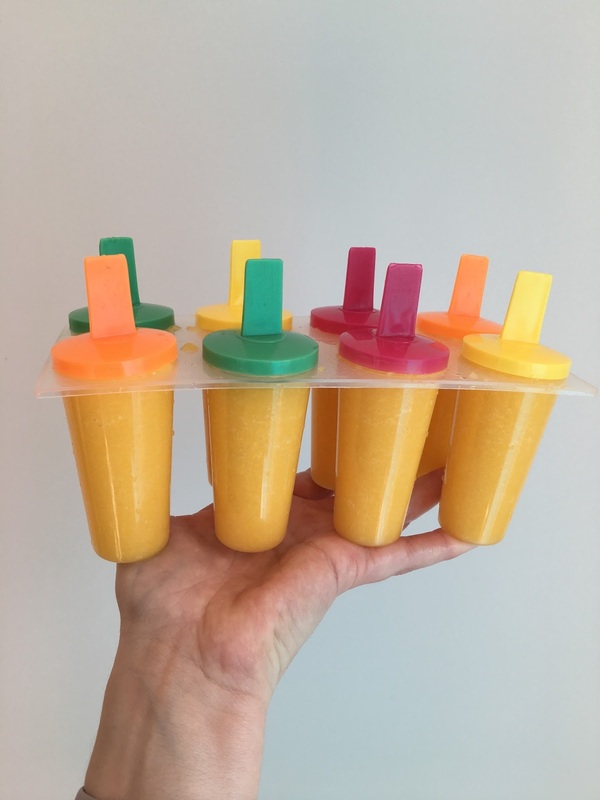 They freeze pretty quickly, and when my children grab them from the freezer after a day at school, I know they're getting mango, hydrating coconut water and a little hint of lemon just to freshen everything up. Mickey's beef liver pâté with bacon is a regular on my cooking rota. I make a batch of it (seriously, beef liver isn't that bad at all - and it's incredibly nutritious, with things like vitamin D in there as well as iron and those all important B-vitamins). The bacon gives it that crispy edge. I like to stir the bacon through rather than scatter it on top, and then I portion the liver out and freeze it individually. My husband grabs an icy slab out of the freezer and takes it to work, with a pile of oat crackers for his lunch - it defrosts by lunchtime. I've eaten it for breakfast and it's kept me full for ages. It feels like your body is too busy putting all those nutrients where they need to go to think that you're hungry. As well as pâté and lollipops, there are drinks, smoothies, stews, roasts, veggies - and that incredible cheesecake that I looked at longingly three years ago and decided that I could totally do AIP, even if it was Christmas soon. Honestly, I love it. I'm not being dramatic when I say that it was this book that inspired me to blog about paleo and AIP. It helped keep me on track when I healed my psoriasis (and I did). And it's available now on Amazon for you to buy in the UK, complete with metric measurements so you don't have to convert everything into grams from cups. Beautiful. Go check it out on Amazon: Mickey Trescott's Autoimmune Paleo Cookbook. And here's me talking about it on my You Tube Channel. Come subscribe for more videos! Do you have the cookbook? What are your favourite recipes from it?